Stress begins in the mind and ends in the body. The accumulation of fatigue on the body and mind can come from many sources — physical, mental, emotional, environmental, nutritional, inflammatory, hormonal, thermal, among many others and even more when you consider the unique combinations of all that have been mentioned. Fatigue accumulation cannot viewed inside the lens as just the amount of physical activity performed each week, this would be too short-sighted. It is much more than that, I’ve alluded to that in depth both here and here. But, something I didn’t touch on with the amount of respect it deserves is the impact at which chronic stress can have on your health, performance, and recovery. To start this off, here’s a good study (http://www.ncbi.nlm.nih.gov/pubmed/24343323) done showing the effect of chronic stress on recovery. If you have read my previous articles you know you can only ever make progress based on what you can effectively recover from. If you’re not recovering, you’re not progressing. Period. In this study, participants did 6 sets of leg press to failure. The group with low stress was recovered and back to full strength two days later, whereas the group with high stress took as long as four days to recover from the exact same training volume. To quantify this, they took twice as long to recover and were also reported more muscle soreness and higher levels of subjective fatigue. I wanted to start here because this is a great example for those of you who aren’t into all the physiology stuff I normally write about. The individuals in a stressed out state in this study took up to twice as long to recover from exercise than the control group. This is huge, imagine yourself and your buddy hitting a leg work out together on Tuesday but you’re under much more stress than your buddy. You may not even be fully ready to rock come Friday when it’s game time, whereas he is going to be good to go. From this point, your stress-free training partner is going to want to train legs again with you next Tuesday because he had no problem with it, whereas you are more than likely not effectively recovering from any of your training — let alone just the leg day. This will lead to you developing habits such as increased caffeine intake throughout the day trying to tough it out — when really addressing your stress is the ideal route to take in this case to actually improve your performance on the ice and improve the results you’re getting from your workouts. There is a reason stress doesn’t feel good inside your body, it creates a lot of physiological problems. It’s not comfortable at all when you’re under stress, and most of the times stress and anxiety make you feel like total crap from the inside-out. In small doses, the stress response isn’t such a bad thing. The problems are primarily rooted in chronic stress. It’s important for the Hockey Training audience to understand both the “how” and “why” towards the negative implications of stress towards your health and performance so that you will be better armed after reading this to go out there and make the right decisions. When dealing with chronic stress you are dealing with a myriad of hormones and physiologic processes, but few of which are more important than cortisol. Cortisol, as many people know, is a stress hormone. 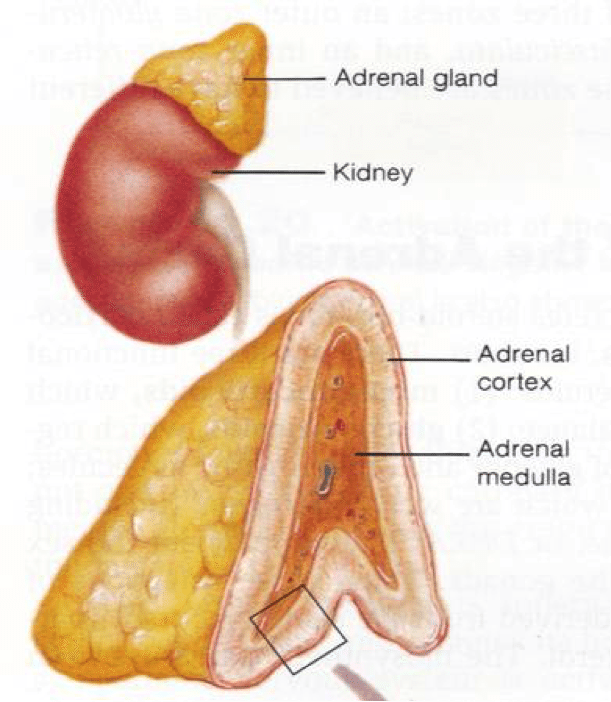 It is created from the adrenal cortex as part of the HPA axis and is considered a primary hormone in the body. Primary hormones are hormones that are necessary for survival. This is the difference between primary and secondary hormones. When you see a gorilla coming at you full-speed your body is going to secrete huge amounts of stress hormones like epinephrine (adrenaline), nor-epinephrine, and cortisol to put you into “fight or flight” mode to save your life because that is your bodies main job, to keep you alive in any stressful scenario. Whereas when you’re thinking about food, appetite hormones come second. Because hormones such as ghrelin that stimulate appetite don’t save your life in dire consequences. Dinner can come later, for right now, your body needs to create stress hormones so that you don’t become dinner. This is a major problem with today’s society. We are subjected to too much stress that our bodies are constantly creating this “2nd grade” adrenaline hormone called cortisol. Not quite adrenaline, but a stress hormone nonetheless. Things like E-mail alerts, text alerts, scheduling, forgetting something, traffic, awkward conversations, stressful work environments, finding a parking spot, the list goes on and on about certain scenarios that cause our bodies to create this stress hormone cortisol. What makes things accumulate in a bad way is the fact that all forms of stress create cortisol — whether it be mental, physical, environmental, or emotional. These stressors do cause some stress hormones to be higher than others due to variance in hormone output. Each stressor creates its own “stress signature” within the body where variance within the stress hormones have different ratios within each other. What this means is that although all stressors create similar hormones, they do not create them in the same amounts or in the same ratios from one stressor to the next. Cortisol, being a primary hormone in the body; will then down regulate the production of many other hormones so it can do its job. Essentially, shutting all other hormones up so only he can talk. So, there is a massive suppression of other healthy hormone production which results in some major hormonal imbalances. Here’s the thing though, cortisol is not a bad guy. It is simply doing its job within the body, just like every single other hormone with the ultimate goal of maintaining homeostasis. When your body thinks it’s under stress, these things are released to save you and keep you alive another day. The real problem is, too low of cortisol, or too high of cortisol is a very bad thing. Complications for increased cortisol levels include: osteopenia, sarcopenia, syndrome X, cognitive decline, immunological compromise, fractures, frailty, cardiovascular disease, memory loss, infections complications and many more. Let’s talk about some major factors within health and performance that the hockey athlete should be concerned with and have on his/her radar when trying to become the best they can be. First off, it can lower immune system function. A large part of your ability to build muscle mass is a function of how strong your immune system is. Because if you have a good immune system, your ability to effectively recover from exercise is much better which leads to greater overall gains. If you have a poor immune system, so if you’re always getting colds or getting sick, your ability to put on muscle mass is much weaker. Cortisol effects immune system function through suppressing your white blood cells ability to effectively work and do their job. Chronic stress can actually act as a signal to stop immune system cells in their track. In short bouts of stress, cortisol can stimulate immune system activity, which is a good thing. But long term, prolonged exposure to stress does the opposite and wreaks havoc on your immune system by increasing overall inflammation and decreasing immune system activity. Good examples of prolonged exposure to mental or physical stress and its effects on immune system function are found within college / university kids around exam time, and professional athletes. College and University students are always getting sick around exam time because this is a very stressful time in their life, with that stress comes chronically increased cortisol and with chronically increased cortisol comes decreased immune system function. UFC fighters in particular always seem to catch a bug prior to a big fight simply because they have been so hard on their body for so long during training camp that their immune system simply can’t keep up. Beyond immune function, chronic stress can lower your testosterone levels. Cortisol runs antagonistic with testosterone. Meaning, when testosterone levels are high, cortisol levels are low, and when cortisol levels are high, testosterone is low. Improving the ratio at which testosterone is with cortisol is vital to performance, muscle building, fat loss, and optimal health. The way in which cortisol lowers your testosterone is through various different mechanisms involving decreasing your quality of sleep, increasing inflammation, and decreasing the absorption of vital nutrients in the GI tract from gut issues. But at a cellular level, when you’re subjected to too much stress, your body opts to make cortisol instead of testosterone because testosterone is a secondary hormone and cortisol is a primary hormone (The body will always prefer primary hormones over secondary). Why your body doesn’t just create both is because they both use the same raw materials; cholesterol and pregnenolone. Through a variety of biochemical processes cholesterol precedes and is converted eventually into pregnenolone. From here your body has two choices, it can use the pregnenolone to create testosterone, or it can use it to make cortisol. Your body is very biased in using the pregnenolone to make more cortisol if you are subjected to any type of stress and which you learned above, can come in the form of pretty much all of life’s problems. To put it simply, our bodies unfortunately will produce cortisol instead of testosterone, so, high exposure to stressors and high levels of cortisol = lowered testosterone levels. Which is the last thing athletes like us want when it comes to performance, muscle building or fat loss. And yes, i’m talking to you too ladies — testosterone is important for you too. Something important to keep in mind here, acute stressors are not to be worried about. Small stressors are a part of life and are unavoidable. Chronic stress on the other hand is when these things that I’m talking about begin to arise. The longer you allow yourself to be stressed, the greater hole you’re digging. Life is 10% what happens to you, and 90% how you react to it. Manage these little stressors as best as you can. On this chronic stress note, chronic stress is an overwhelming contributor to poor sleep quality within the athletic population. Chronic stressors have many of the impacts they have on the body due to their ability to decrease neurotransmitter levels. Neurotransmitters are what your body uses to communicate from one tissue to the next, and they are also very heavily involved in how you act as a person. Neurotransmitters create feelings and thoughts like happiness, motivation, focus, drive — and are involved in everything from speed of thought to speed of movement. How stress effects your sleep is because it decreases your overall neurotransmitter pools, which, in turn, decrease your body’s ability to get into a deep REM sleep level. Neurotransmitters such as serotonin and GABA are vital to a good night’s sleep, and when your overall pools are low then your sleep quality is going to be low as well. Cortisol’s effect on just your sleep alone can result in any one, or combination of these issues. Sleep is one of the first things I discuss with my 1-on-1 clientele to make sure we are good to go. If not, that’s where I begin the coaching process. Improving sleep quality through smart supplementation and proper meal planning. Beyond the, what seems to be million reasons I have outlined above to avoid a high stress lifestyle, this discussion can actually continue believe it or not involving much more. This is just scratching the surface. But I believe you’ve probably had enough of this for now and I REALLY don’t want to stress you out about it. I have met a lot of people in my life doing what I do. The one connection I find between the most successful people I know, is that they are positive people. This does not just go for muscle building or hockey performance. This goes for doctors, businessmen, trainers, coaches, anybody who has truly found success and happiness, is extremely positive about life. They never look for the negatives in things — and when the rain does come, they find what positives can come from it and what perhaps they can learn from it as opposed to sitting around sulking and being negative. Being positive is one of the best things you can do for your mind and your body. Think about the people you like to spend time with. How many of these people are jerks? None of them I hope. They are more than likely happy, positive people who are fun to be around. This is the type of attitude the healthiest people adopt and is the type of attitude that will serve you very well. It can be sometimes tough to connect stress and positivity towards how you play on the ice, but when the physiology is all laid out, it begins to look like one of the most important factors. Which it most certainly is. I hope you have learned some of the detrimental impacts stress can have on your state of health, body composition, performance, productivity, sleep quality, and mindset. Being positive about life will bring down stress, bring down cortisol, and allow you to be a much happier person. Yes, I do understand that this is an online blog about hockey training, which is why I am discussing mindset. Having a positive outlook on life TRUMPS any type of stress that comes your way. Very few things in life that we allow ourselves to become stressed by actually have any real consequential status. Who actually cares if there heavy traffic? It’s not going to change, so there is no sense in getting mad about it. Who cares if your internet is down? Literally nothing bad is going to happen. 1. If at all possible, avoid stressful situations. 2. Minimize your time on social media, or just wasting time in general (i.e. TV). 3. Practice some form of meditation. 4. When you feel yourself start to get stressed out, close your eyes, take 5-10 deep diaphragmatic breaths, inhaling and exhaling 5-6 seconds a piece. 5. Spend more time with friends and family or engaging in a rewarding hobby. 6. Don’t dwell on past mistakes and failures. 9. Prioritize a good night’s sleep every night. 10. Be a positive person. 11. Eat right and supplement smart. 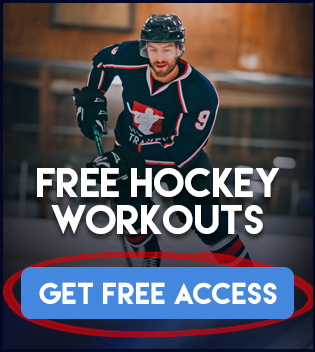 If you’re ready to take your hockey game to the next level check out our Hockey Training Programs for a training program that fits your needs!